Folding your hands together palm to palm. 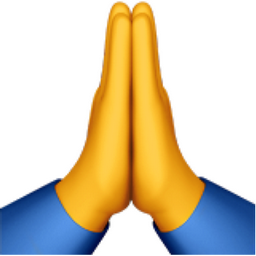 Some emojis show a person with hands together and others just the hands. To pray. Also used to say sorry. The Apple version emoji, which does not show a person but just two hands, can be misinterpreted as meaning high five. A high five is when two people slap their hands together to express excitement or celebration. Hands together as if you were praying. Please. Names & Annotations PERSON WITH FOLDED HANDS * can indicate sorrow or regret * can indicate pleading Temporary Notes: "Sorry" or "Please"